Wild: Among the island’s tenacious pack hunters is Hyaenodon Dirus, a carnivore most often found across the mountains and tundras, in packs of 3 to 5. The Hyaenodon is a very intelligent predator: before engaging, it determines if the payoff for a fight is worth the risk of injury. Domesticated: Despite being too small to ride, Hyaenodon are still popular pets. Their intelligence means they train well, and their natural pack strength makes them excellent hunting dogs. Their capability to quickly recover health by consuming raw flesh off the bone ensures they can take much punishment and yet continue fighting. A common (and terrifying) sight on the tundra is a rider on a canis with a pack of Hyaenodon at it’s side, howls and jeers echoing through the night. Known Information: Hyaenodon often prefer not to fight unless there is already weakened prey nearby, or a fresh carccass. This temperament changes quickly, though, near the presence of injured or dying creatures. 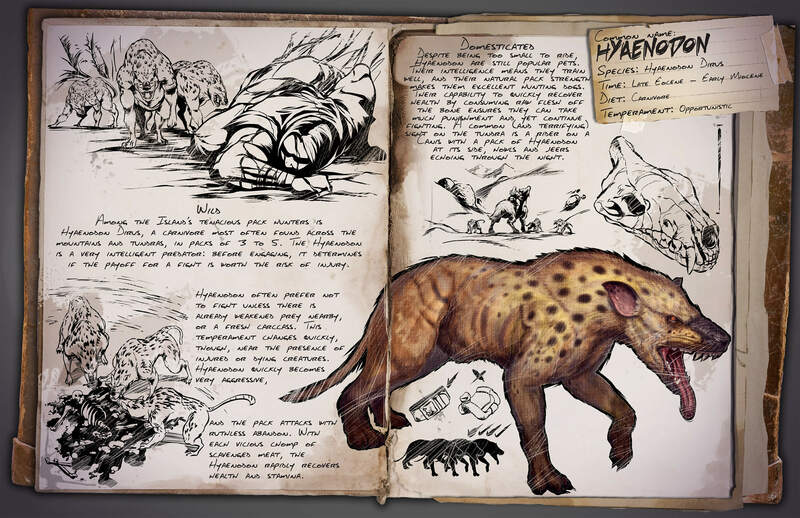 Hyaenodon quickly becomes very aggresive, and the pack attacks with ruthless abandon. With each vicious chomp of scavenged meat, the Hyaenodon rapidly recovers health and stamina.